Baton Rouge has a handful of great places to eat fresh burgers so it is a shame whenever somebody thinks that fast food or national chains offer superior patties. 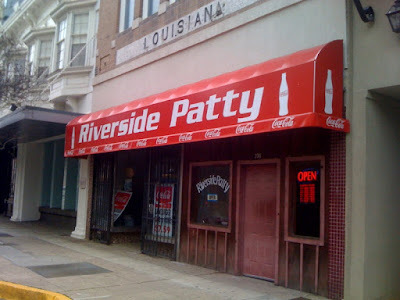 Among the elite burger joints in the Red Stick is Riverside Patty, a staple of the downtown dining scene since 1982. 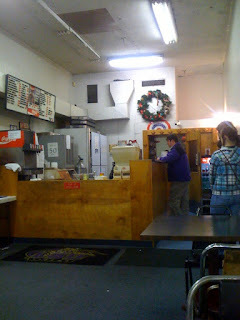 Walking into this place you get the feeling that you're going to eat something good. The surroundings make even a relatively young man like me nostalgic for the days of old school burger joints with classic milk shakes. While Riverside Patty doesn't quite deliver on the shakes, they still do a fine job with the burgers! The place is as casual as can be and could certainly use a renovation, but that's what makes the character so great! On one visit to Riverside Patty with Darrell, I ordered the house special. This combo comes with a half pound burger patty and all the fixin's, fries, and a drink. I ordered mine on a wheat bun with lettuce, tomatoes, onions, and honey mustard. Just for good measure, I opted for a side of sweet potato fries! 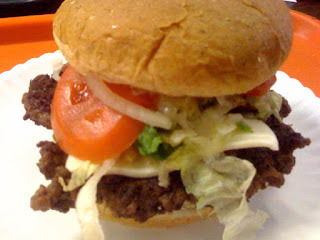 The burger tasted delicious, but it lacked the juiciness that I had previously experienced at Riverside Patty. 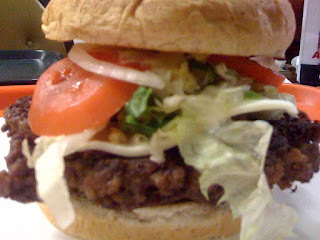 The burger seemed overcooked and indeed the patty was well done throughout, without even a hint of pink in the middle. I was rather disappointed, but still ultimately satisfied. On a future visit with Dana and Becca I ordered a Bacon Swiss Burger on wheat. With all the other toppings the same, I found this burger to be slightly better, though still overcooked. What is it with restaurants these days that make them not want to serve a medium rare or even medium cooked burger? Well done beef is for the birds! 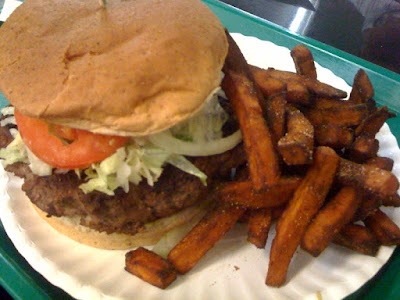 Again, this burger was tasty, but it could have been so much better with a little grease dripping down my forearms! Next time I visit Riverside Patty I'm going to make sure to note that I want the burger cooked medium, not well done!